The organisers of Tedfest and the London Irish Comedy Festival have announced a competition for new Irish comedians, the Toilet Duck London Award. 16 of the funniest new Irish comedians will go toe to toe in a comedy duel until there’s just one left standing! The glorious victor will walk away with the spoils of battle: a paid gig at the London Irish Comedy Festival in October and a beautiful Toilet Duck trophy. Tedfest is the annual fan convention held on the island of Inishmore, off the coast of County Galway, Ireland for fans of the well-lovedsitcom Father Ted. The Toilet Duck London Award pays homage to the many Irish comedians that were cast in Father Ted, including; Dermot Morgan, Ardal O’ Hanlon, Pauline McLynn, Graham Norton, Tommy Tiernan, Patrick McDonnell, Joe Rooney, Jason Byrne, Pat Shortt and Ed Byrne. The London Irish Comedy Festival showcases the wealth of emerging and established Irish comedic talent in the UK. 16 finalists will be chosen to go head to head at the London Irish Centre on the eve of Tedfest London, on Friday 11 July. The knock out battle will be hosted by Colum McDonnell, who has toured with Ardal O’Hanlon, Jason Byrne and Colin Murphy and has performed on Paramount Comedy Channels ‘The World Stands Up’. Toilet Duck London will coincide with the first ever Tedfest London that is taking place the following day, also at The London Irish Centre. Acts should send a short summary (500 words) or CV outlining their stand-up/comedy experience and a short video clip of themselves performing to londonirishcomedyfestival@gmail.com by Friday 6 June. Finalists will be contacted the week of the 9 June. 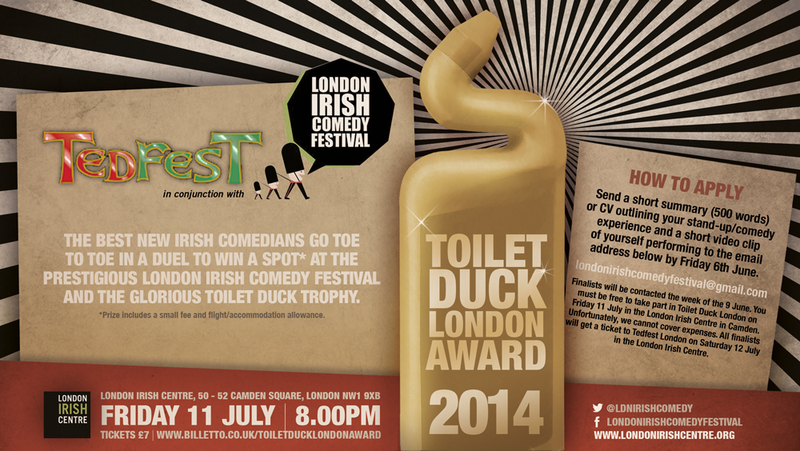 Finalists must be free to take part in Toilet Duck London on Friday 11 July in the London Irish Centre in Camden. *Unfortunately, we cannot cover expenses. All finalists will get a ticket to Tedfest London on Saturday 12 July in the London Irish Centre. The London Irish Comedy Festival was co-founded in 2012 by Maria Schweppe and the London Irish Centre (LIC) to showcase the very best of established and emerging Irish comedic talent from the UK and Ireland. Now in its third year, the Festival is held every October at the London Irish Centre. In 2013 and 2014 the Festival played host to a Comedy Tent as part of the Mayor of London’s St. Patrick’s Day Celebrations. In 2014 the Festival ran a series of Edinburgh Preview gigs. Acts who have performed at the Festival, Comedy Tent and Edinburgh Previews have included; Andrew Maxwell, Neil Delamere, PJ Gallagher, Barry Murphy, Maeve Higgins, David McSavage, Aisling Bea, Roisin Conaty, Abandoman, Fred Cooke, Eleanor Tiernan, Reuben, Jarlath Regan, Rory O’ Hanlon, Willa White, Brendan Dempsey, Colm O’ Regan, John Lynn, Eric Lalor, The Nualas, Sharyn Hayden, Paddy Cullivan, John Colleary, Christiane O’ Mahony and Damian Clarke, Chris Kent, Danny O’ Brien, Foil, Arms & Hog, Andrew Ryan and Conor Drum. The third Festival will be held from 10 – 12 October 2014. Save the dates for some serious craic! Tedfest, the cult festival homage to all things Father Ted, was conceived in 2007 as the antithesis to a TV convention. Described by organisers as ‘more of a state of mind than an actual event,’ Tedfest attracts 400 people each year to the windswept craggy island of Inis Mór, inconveniently located many miles off the coast of Galway. Hundreds more are turned away due to the high risk of death associated with sleeping in a tent on the Aran Islands in winter. Driven by demand from people who would prefer to travel to Tedfest on the Northern Line rather than a Galway Bay ferry The London Irish Centre asked organisers if they would stage a version of the event in London. The result is Tedfest London – described as a One-Day Pop Tart – the event is taking place on July 12. The London Irish Centre (LIC) is a charity that supports the Irish community in London (Registered Charity No. 1149787 Company No: 8221421). Set up in 1954, its welfare service is the largest for Irish people outside of Ireland. Each year the LIC works with thousands of people to improve their housing, income, access to health and social inclusion opportunities. The LIC also delivers a diverse programme of Irish arts, cultural and community events, offering opportunities to connect with Irish culture. The charity showcases the finest Irish talent to London audiences and to offer a taste of home to the city’s Irish community. The LIC’s main premises in Camden Square is the oldest and largest Irish Centre in Britain, and provides a warm Irish welcome to all who visit. The LIC also has offices in West Kensington and Kilburn and provide outreach services to a number of other London boroughs. A percentage of profits from the London Irish Comedy Festival support the charity’s work.